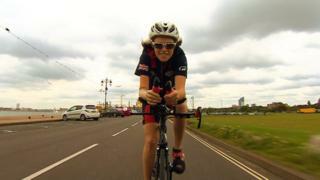 Two-time Paralympic swimmer Lauren Steadman tells Get Inspired reporter Kate Grey about the challenges of switching sports as she prepares for the Triathlon World Series event in London. Steadman won the event, ahead of four-time world champion Faye McClellan, and retained her title a month later at the European Championships in Kitzbuhel. Her switch between the two sports proving to be a successful move for the athlete. Paratriathlon will be making its debut at the next Games, in Rio in 2016. Explore our Get Inspired triathlon pages for tips on how to get involved.